We welcome on unforgettable tour to historical land of West and East Prussia. Places full of history of Middle Ages, habits of Masurians and Warmians people and spots affected by terrible time of Second World War. Masurian is also magnificent nature so we will use kayaks to show you the beautiful lakes, so rare in Poland swamps and bogs, the network of rivers and canals. Arrival to Gdansk, pick up from Hotel or airport. Meeting with a guide and transfer to Masurian Lake District. Open air museum with 74 architecture objects from Masurian, Warmia, Powisle, Small Lituania. The museum contains knowledge about history of architecture, agriculture, habits, culture, religion of this interesting region in one place. Wolf’s Lair: Hitler’s headquarters, very well-guarded place from which the Hitler commanded the Nazi State continuously from 1941 to November 1944. Among others available for sightseeing is Hitler’s bunker and air-raid shelter, command centre and security center, residence of Hermann Göring, Martin Bormann, Wilhelm Keitel, Conference room where20 July 1944 took a place assassination attempt on Hiltler life. Canoeing on Krutynia River from Ukta to Iznota (5h). Krutynia River is one of the most beautiful and most popular rivers in Poland as well as in Europe. 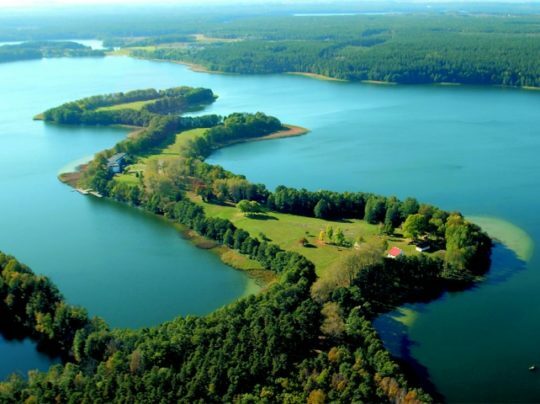 The route called „Masurian Amazonia” is about 15 kilometres long, includes 2 lakes ( Gardyńskie and Malinówko ) and go through the northern part of the Pisz Forest, the biggest forest complex in the Masurian Lakeland.